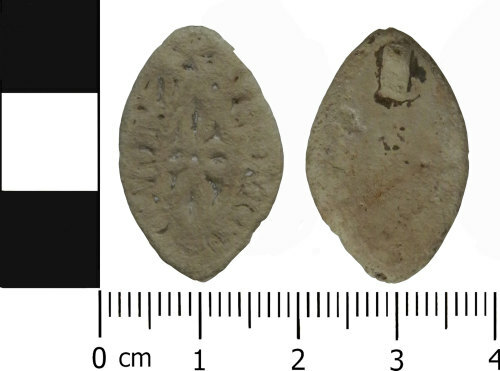 A lead seal matrix dating to the Medieval period, c.13th century. It is pointed oval and flat, and now worn. The central device is a star, pattern or perhaps a flower, of eight radiating lines. Four (at the cardinal points) are simple lines but the ones in the angles are nail-like, each ending in a crossbar. Surrounding this is a worn groove. Beyond the groove is the legend, apparently well engraved but now worn and shallow and difficult to read. It certainly begins + S'. (Seal [of...]), indicating that it was a personal seal bearing a name. The rest is not legible from the photo alone. The rear of the object is slightly concave in the centre and is undecorated. At the top of the object is a projecting lug which is incomplete and would have acted as a handle. The object has a light white patina. Dimensions: 21mm in length, 16mm in width, 4.5mm thick (at handle), 5.7g in weight. Seal matrices bearing names were most common in the 13th century.